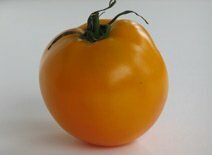 The beautiful orange Valencia tomato has a refreshing tomatoey taste with a balance of acidic and sweet flavors. As this heirloom tomato originated in Maine, it is a great choice for cooler climates, and I can attest to it growing well in Seattle where I live. The Valencia is thought to be named after the Valencia orange because of its color. The fruit's texture is smooth, firm, and meaty without a large number of seeds. Because this tomato's shape isn't as camera-friendly as some of the more unusual looking heirloom varieties it can be overlooked and harder to find. Its great flavor makes it worth searching for.